For over one hundred years archaeologists have explored the land of Israel, investigating such fascinating topics as the migrations of the patriarchs, the Israelites' conquest of Canaan, and the establishment of the monarchy by David and Solomon. In this book some of Israel's foremost archaeologists present a thorough and up-to-date survey of this research, providing an accessible introduction to early life in the land of the Bible. The authors discuss the history of ancient Israel from the Neolithic era (eighth millennium B.C.E.) to the fall of Jerusalem and the destruction of the First Temple in 586 B.C.E. Each chapter describes a different era as seen through relevant archaeological discoveries. 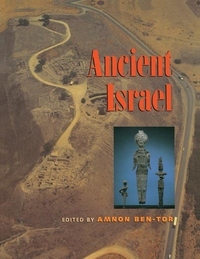 The reader is introduced to the first permanent settlements in the land of Israel, the crystallization of the political system of city-states, the nature of Canaanite culture, the Israelite patterns of settlement, and the division of the country into the kingdoms of Judah and Israel. The lavishly illustrated text explores and demonstrates developments in religious practices, architecture, technology, customs, arts and crafts, warfare, writing, cult practices, and trade. The book will be a delightful and informative resource for anyone who has ever wanted to know more about the religious, scientific, or historical background to the events described in the Bible, or to current developments in the Middle East.